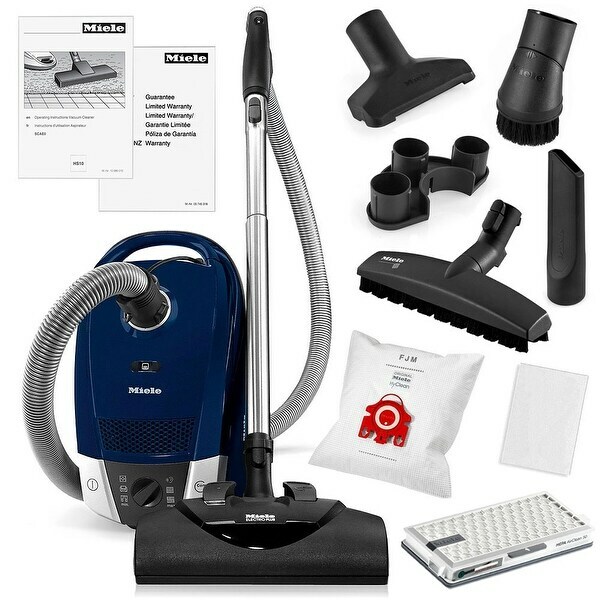 I ordered the Miele after much research; my main reason why I went with a Miele is because we suffer from Serious Allergies & my oldest has Asthma; I read & watched You Tube Video’s regarding Miele Vacuum Cleaners & the Filteration Sytem they have. This Miele Compact is small but powerful & quiet compared to other vacuums I have owned. - Extremely Lightweight and Powerful - Only 10 lbs! - Variable Speed Control - 6 Different Speeds allowing Perfect Suction for Drape, Rugs, Bare Floors and More! This is an awesome vacuum! I don't usually get excited about vacuums, but we decided to spend a little more on this one and it is worth every penney. It is lightweight and powerful. Having all the attachments on board is also a plus. The power nozzle is self propelled and easy to maneuver, even on high pile carpets. The hard floor nozzle is a little wider than most (another positive) but still fits under furniture and into corners nicely. Well made and will last for years. We prefer bagged vacuums because of allergies and the Hepa filter is great. This is an amazing vacuum all functions can be controlled while standing upright which is so easy on the back. I now own my second Miele and love this compact more than ever because of the light weight and outstanding filter system. I have experienced difficulty using a number of highly rated HEPA vacuums because they are bagless. This Miele has, as an option, cloth bags that enhance the filtration. Miele has proven to me over the years that it is the only vacuum worth considering. I received it in a timely manner and have been using it regularly for the past few months. It has a nice group of attachments as well as a way to carry most of the attachments right onboard the vacuum. The attachments themselves are sturdy, functional and easy to change. I love the power head that comes with this vacuum and feel it is well worth the extra cost. The exhaust air coming out of the vacuum does not create any type of allergic reaction for me. I am thankful to have found my first Miele, which I gave to a friend, and to now own this newer model. This particular model is made in Germany and is of the highest quality but lightweight. I will mention that the powerhead is heavy but easily detaches in order to transport it separately from the vacuum itself. I was looking for a well built vacuum cleaner that has a roller brush for area rugs that also works on hardwood floors. This vacuum does both and does a great job. The 25' self winding cord is just one of the really nice side benefits of owning and using this vacuum. The head is flexible and can get under our sofa and most of our living room, dining room and kitchen chairs. It is quiet to use. Easy to carry around handle if needed. The canister rolls freely behind as you vacuum. I have used all of the tools and have not been disappointed. With some vacuums you have to repeat the same pattern over the same area to get it clean but this vacuum does it with one sweep. I have changed the bag once-- not hard to do. I assembled the machine when it came. So,e have said it was a little difficult. Take your time and think a bit European efficiency and you won't have a problem. Our eldest came home for a visit and used it and said it was a great machine and liked the swiveling head and the fact that it was quiet. Overall just really happy and satisfied with this machine. Great Miele quality. Worth the extra cost for the Powerhead to really clean plush carpets. Light and quiet. Shipping was a little slow but it was from a third party seller. Great product, especially with the electronically driven floor piece. The only downside to me is the way the extra tools are stored. It definitaly lacks a built-in storage compartment. The miele vacuum cleaner is a very powerful vacuum cleaner. I really love it. It is a bagged vacuum which is nice for the allergies. I would highly recommend. I think this vacuum is way overpriced compared to similar Electrolux models. I bought it because of all the great reviews but I don't find it to be as reported. I still have to go over my shag carpets repeatedly to get them clean. No one sweep for me. I have to drag it around as it doesn't follow easily. If I stop for just a moment on my carpets the brush rollers shut off and I have to get on flooring and turn them back on. I do like the power cord. It rewinds automatically everytime - but that's not worth the price to me. I wouldn't buy it again and I wish I had stuck with the Elextrolux brand and not experimented with this one. It's not a bad vacuum, just not worth this price in my opinion. Yes, would recommend. Does the job! Great Suction. The handle is a bit heavy for my liking. Great for people who have pets. I had been in search of a vacuum that would not clog with dog hair. This is the one. I will buy another when i need one. This is the Cadillac of vacuum cleaners. It’s durable, quiet, clean and easy to use. My first Miele is 23 years old and the switch broke. I hope I get that many years from this vacuum. I was pleasantly surprised by this lightweight, but powerful vacuum cleaner! It only weighs approximately 10 pounds, which is so perfect for someone with major neck & spine issues. I love, love, love it! Thank you, Overstock! I had to contact customer service by phone after hours and the gentleman I spoke to was absolutely one of the most helpful, kind, and professional assistant ever! Thank you again! FIVE STARS! I have a pile high rug and the reviews overall were good. My wife did some research and felt that this vacuum cleaner offered the best value as to cleaning ability and longevity. "Could you please explain what the 2 different warranty plans are and what they consist of. Thanks t lake"